We provide services within a range of imaging techniques, such as confocal, live-cell, and various superresolution imaging techniques. We routinely train users in microscopy, enabling them to independently operate our microscopes, while we also offer microscopy as a service. Contact us if you would like to make an appointment for training. We also offer to have meetings with users to discuss imaging needs and options. Contact us by mail for further information and/or protocols for sample preparation. The Core Facility for Advanced Light Microscopy, Montebello holds a Zeiss LSM 710 confocal microscope, a Zeiss LSM 880 Airyscan FAST confocal microscope, and a DeltaVision OMX V4 Blaze super-resolution microscope (from GE Healthcare), as well as software licences for Imaris and Huygens. 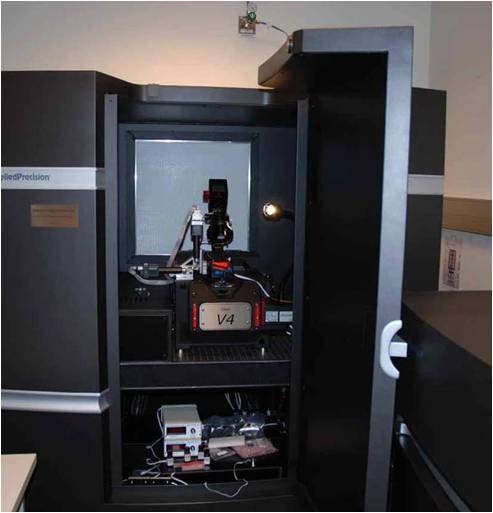 This is an inverted, confocal microscope, equipped for live-cell imaging including a definite focus system. It comprises several laser lines (405, 458, 488, 514, 561, and 633 nm). Available objectives: 10x NA 0.45 DIC II (Plan-Apochromat), 20x NA 0.8 DIC II (Plan-Apochromat), 25x NA 0.8 (LD LCI Plan-Apochromat), 40x NA 1.2 Water Imm DIC III (C-Apochromat), 63x NA 1.4 oil DIC III (Plan-Apochromat), 100x NA 1.46 oil DIC III (alpha Plan-Apochromat). 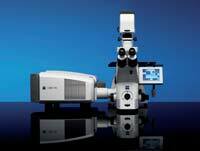 LSM 880 Airyscan FAST is a confocal microscope equipped with an Airyscan detector and FAST options. The airyscan detector gives possibilities for superresolution imaging with a resolution upto 1,7 times that of conventional confocal imaging. The airyscan detector also provides high sensitivity and can be combined with the FAST beam shaper to give fast and gentle live-cell imaging. Laser lines: 405, 458, 488, 514, 561, and 633 nm. Available objectives: 10x NA 0.45 DIC II (Plan-Apochromat), 20x NA 0.8 DIC II (Plan-Apochromat), 25x NA 0.8 (LD LCI Plan-Apochromat), 40x NA 1.2 Water Imm DIC III (C-Apochromat), 63x NA 1.4 oil DIC III (Plan-Apochromat). Definite focus 2 system. Temperature and CO2 controlled chamber. 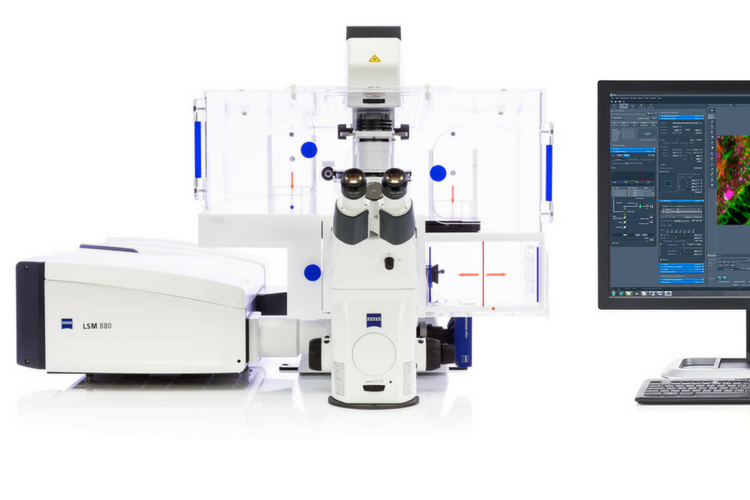 The DeltaVision OMX V4 Blaze 3D-SIM microscope is an advanced multimode, super-resolution microscope system. SIM: structured illumination microscopy for multicolor 3D super-resolution imaging. Gives a resolution down to 110 nm lateral and 330 nm axial. Localization microscopy (STORM): 2D super-resolution imaging with a resolution down to 20 nm. Conventional mode: ultra fast widefield imaging, with temperature and CO2 control for live cell imaging. TIRF: Total Internal Reflection Fluoresence, for enhanced signal-to-noise imaging of the surface of a cell/specimen. PhotoKinetics/Photoactivation imaging system for photoactivation, FRAP, and FRET imaging methods. Other features of the OMX: 6-color solid state illumination and 6 lasers (405 nm, 445 nm, 488 nm, 514 nm, 568 nm, and 642 nm), UltimateFocus Hardware Autofocus System, three high speed sCMOS cameras. Objectives: 60X NA 1.42 oil PLAPON6 PSF, 60X NA 1.49 TIRF, and 60X NA 1.30 Sil. Imaris - Imaris (Bit-Plane) licence version 9.0.2, which includes algoritms for Visualization, Segmentation, Classification and Statistical Analysis of Surfaces, Spots and Contours, for Tracking Objects, and for Colocalization Measurements. 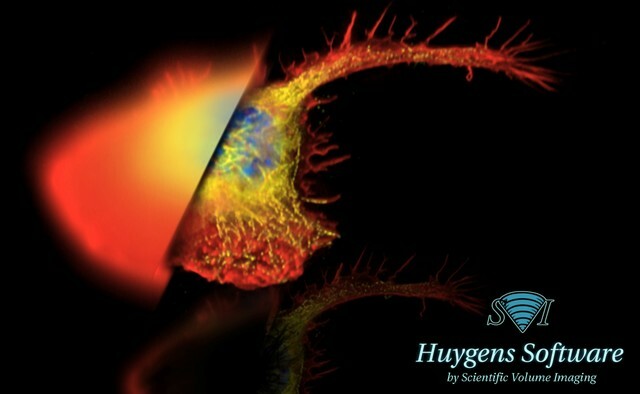 Huygens- Huygens Essential, version 14.06, image processing software for deconvolution, visualization and analysis.